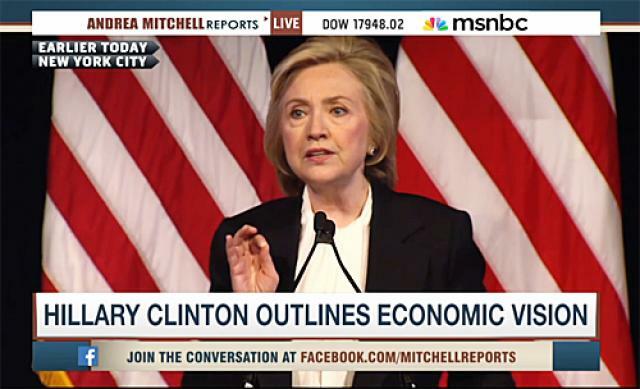 Hillary Clinton’s big economic speech has mostly been greeted with yawns. Previously the conventional wisdom was that Hillary Clinton was one of Wall Street’s favorite candidates, and her speech has not changed this. She did include a number of points which sounded good, but lacked any specifics to make a convincing case that she would really bring about any changes. She did correctly criticize Jeb Bush for his recent comment that Americans should “work longer hours” and Marco Rubio’s tax cut for millionaires. She did sound like she might be more willing than President Obama has to prosecute bankers who violate the law. She fell far short of Bernie Sanders’ support for breaking up the big banks, as well as short of the specific economic proposals recently released by Martin O’Malley. She basically seems to desire to use the rhetoric of Sanders and O’Malley, as well as Elizebeth Warren, while keeping the big corporations and banks confident in continuing to bankroll her campaign. Hillary Clinton gave her big economic speech this morning, proposing a whole array of policies that she argues will “build a ‘growth and fairness’ economy.” She wasn’t especially forthcoming on details, which is a shame, but she had some interesting and ideas and made some promises that she should be held to going forward. Posted in Barack Obama, Bernie Sanders, Economy, Elizabeth Warren, Hillary Clinton, Jeb Bush, Marco Rubio, Martin O'Malley. Tags: Barack Obama, Bernie Sanders, Hillary Clinton, Jeb Bush, Marco Rubio, Martin O'Malley. RSS feed for comments on this post.. TrackBack URL. Bernie fans will never be happy with her or her positions. As for direct comparisons, she said she will protect Obamacare and did NOT say "Medicare for all," indicating that is not her aim. And though she put off specifics I would expect her plans for education would place her squarely to Bernie's right, as well. Are Warren and O'Malley also to Bernie's right? Maybe between Hillary and Bernie somewhere? Warren and O’Malley are probably to Bernie’s right (keeping in mind the limitations of using a linear left/right spectrum) but the three are far closer together with Hillary off to the right of them. I am worried about how she will go about protecting Obamacare. In the past I have generally been unhappy with her comments when she would go into the specifics of health care policy. Plus HillaryCare was terribly designed plan.